My Raspberry Pi while it was getting set up, mouse, keyboard, and monitor attached. I grew up on unavoidable advertising. We lived in a rural area when I was a kid, with no cable. All of our TV came in over the aerial my dad had set in cement behind the house. My parents explained that TV stations made their money by showing advertisements, and even though we laughed at the stupid ones, it seemed like a pretty fair exchange. Our newspapers and magazines all had advertisements in them too, as did the radio station my mum liked to have on in the kitchen. Ads were just a part of any ephemeral media. Advertisements were part of the culture. We’d make up parodies of jingles we’d heard too often. We’d make fun of announcers over-dramatically declaring a sale at the nearest discount furniture warehouse. And sometimes, when an ad was really good, it would become part of the zeitgeist, part of slang. Say, “Anything?" to someone who grew up in Ontario in the 80s with the right tone of voice and an arched eyebrow, and they’ll know you’re quoting a Cadbury Caramilk ad. Start singing, “when you eat your Smarties, do you eat the red ones last?” and they’ll join in. Advertisements could even be art. I’ve always been a fan of Volkswagen’s famous “Think Small” ad, a print ad from the 1960s which still works well in a web version today. I have a vintage Canadian National Exhibition poster adventising the fair’s 75th anniversary, and postcard collections of vintage ads from Europe advertising emigration passage to Canada. And maybe nostalgia is a factor, but there just don’t seem to be as high a percentage of really memorable ads in the internet age. Maybe it’s also fragmented audiences, and the fragmented budgets that go with them. Or maybe it’s just misapplied targeting. The ads I get the most are for dental implants, on-line clothing stores that don’t carry clothes I like, and, for some bizarre reason, Ford F-150 pickup trucks. I mean, my dad had one when I was a kid, but I live in a condo in a city and work in an office now. You could probably fit my car onto the bed of a Ford F-150. And then there’s the significant issue of ads slowing down web page loads. A lot. To the point that for some magazine-type web sites, I can only have one tab/article open at a time, or else it slows my computer or phone down more and more, until the machine freezes and needs to be restarted. At that point, both the content provider and the advertisers have just eaten their opportunities. So my expensive data plans have long been going towards showing me ads for stuff I don’t need, don’t like, don’t use, and don’t find especially pleasant. I get that the transaction is still supposed to be that I receive content in exchange for exposing myself to advertising, but it’s not working, and it hasn’t been for a while. Hence the Raspberry Pi computer in the photo at the top of this post. I just bought it over the weekend. In the photo it’s sitting on top of its case instead of inside it, and it has all those plugs plugged into it because I needed a keyboard, mouse, and monitor attached to complete its setup. After the basics were done (download and copy the prescribed NOOBS files to a micro SD card, follow the setup instructions), I entered the command to download and install Pi-Hole onto the Pi. Then it was a case of changing two settings on my router (the Pi-Hole setup makes it clear what to do), and I was done. Pi-Hole is a DNS server which links to multiple blacklists of domains having to do with advertising. If a device on your network requests a content page, say a page from an on-line newspaper, Pi-Hole will let through all the requests for the newspaper’s text, images, and other content, but not allow through any requests related to advertising. That’s not just requests to display ads, but requests to send out your data to advertisers as well. It’s not really ad blocking so much as domain name blocking, and it’s very effective. Devices just need to be on your network — no browser extensions required. 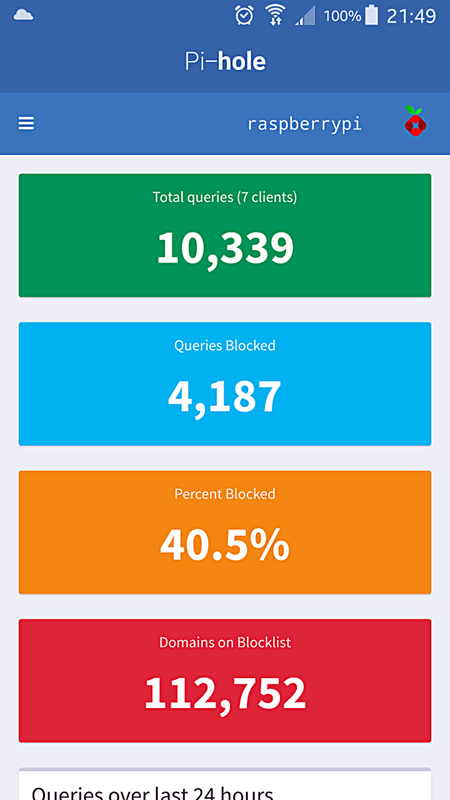 Pi-Hole dashboard stats: 10,339 queries, 4,187 of which were blocked (40.5%). The Raspberry Pi now lives in its case, with only its power cord attached, behind my TV set. It takes up slightly less space than if I left a credit card lying there. If I want to see how it's doing, I go to the Pi-Hole dashboard and check the stats. The screen shot to the right shows what the stats were at as I was writing this, about 48 hours after I got everything up and running. See that? 40.5% of my requests to the web were for advertising, or sites related to advertising. The day I set it up, I tried a few sites and then went straight to bed, my phone the only internet-connected device turned on. In the morning, I found out the phone had made over 1,000 block-worthy requests while I was asleep. What the stats don’t tell you is how it changes the browsing experience. It is shocking how quickly web sites load now. Where ads were supposed to be doesn’t show up at all, or shows up as easily-ignorable white or grey boxes. All those times I was worried my laptop was too old or too underpowered to load certain sites, and it turns out the advertising was using all the resources. I’m still not against advertising. I’m really not. What I’m against is the method of advertising that the Pi-Hole shows up: the kind that devours bandwidth, freezes devices, and overall doesn’t care at all that it’s annoying its target audience, all the while depending on algorithms which don’t seem to work especially well. If I knew I would be getting a quality advertising experience from certain quarters, one that was speedy and pleasant and actually pertinent to me, I’d be happy to whitelist some domain names. Pi-Hole makes it very easy to do that. But I’ve been on the internet since 1995, and advertisers have had plenty of chances to fix their approach. I don’t feel bad about popping $50 to block them altogether at all.